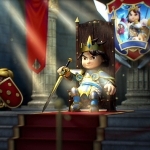 A lot of the shots are from TV spots done for mobile game developer Upjers. I had a lot of fun animating those weird characters, and I directed the spot with the themepark rides. There are also some shots I animated for a Playmobil shortfilm, as well as some shots from the shortfilm Grisella.